(left) Andy Lau spills some blood, and (right) Maggie Q gets musical in Three Kingdoms: Resurrection of the Dragon. The Skinny: Solid in a flashy, commercial, and empty manner. Purists of Three Kingdoms lore will be annoyed, and those who seek quality cinema may find the film lacking, but the undemanding may still enjoy the spectacle in all its dry, canned glory. John Woo and Red Cliff shouldn't worry too much. Three Kingdoms, here we come. Chinese cinemas will be assaulted this summer by John Woo's Red Cliff, which adapts one of the most decisive battles from the legendary Three Kingdoms Era. Not to be outdone, director Daniel Lee (Dragon Squad) enlists go-to actor Andy Lau for his third ancient-costume adventure in less than eighteen months. Yet another Three Kingdoms tale, titled Three Kingdoms: Resurrection of the Dragon, the film arrives in cinemas a full 2-3 months before Red Cliff, which could be viewed as some sort of preemptive blow to Red Cliff's kneecaps. Well, John Woo needn't worry too much. Not only does Three Kingdoms possess fewer stars than Woo's insanely star-packed epic, but it plays fast and loose with acknowledged history, which counts as strike one when the source material is as beloved as this. The film is also more of an MTV war epic than a gritty or stirring one, choosing manipulated image over actual content, and the film never surpasses its obvious commercial aspirations. Does this mean that Three Kingdoms is a bad film? Not really, but it could easily have been better. 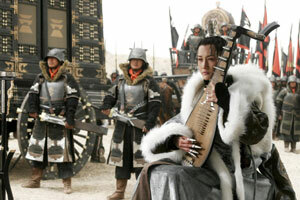 Andy Lau stars as Zhao Zhilong (a.k.a. Zhao Yun a.k.a. the guy who's on the cover of all those pesky Dynasty Warriors video games from Koei), a legendary warrior in the employ of general Liu Bei (Yueh Hua), beloved leader of the Shu Kingdom. Zhilong joins up as a regular soldier in Liu Bei's army, but soon rises in the ranks. When defending bumbling pal Pingan (Sammo Hung), Zilong impresses Liu Bei's lieutenants Guan Yu (Ti Lung) and Zhang Fei (Chen Zhihui) with his fighting skills, leading to praise from Liu Bei himself. Zhilong's renown grows even further when he rescues Liu Bei's infant son from the clutches of opposing general Cao Cao (Damian Lau). Zhilong not only makes off with the kid, but also gets to rub his victory in Cao Cao's face, laughing maniacally at Cao Cao from across a canyon gorge after escaping with the tyke. On that day, Zhilong sets the stage for his later life, not only becoming insanely popular with the people, but also earning the ire of Cao Cao's granddaughter Cao Ying, who one day becomes a beautiful, deadly, and stoic warrior embodied by Maggie Q. By then, Zhao Zhilong is on top of the world, and is billed as an "unbeatable" warrior. Obviously, someone is ripe for a fall, and that's just what happens. Sort of. Zhilong's fame results in a big fat target on his back; besides earning the enmity of Cao Ying, Zhilong engenders the ire of some comrades, who may be willing to backstab him for a chance at military glory. In a departure from the usual Three Kingdoms lore, there's court (or battlefield) intrigue afoot. A betrayer exists in Zhilong's ranks, which the film reveals in a clumsily telegraphed plot twist. What's more important, however, is how this detail changes this war epic into some sort of minor critique on warmongering. Zhilong has long been attempting to encircle the land under Liu Bei's protection, but the analogy arises that this may be much the same as simply going around in circles aimlessly. There are some interesting themes and ideas in Daniel Lee's war epic, and one hopes that two hours is enough time to cover them all. Surprisingly, two hours isn't enough at all, though one could wonder why not, especially since not that much really happens in Three Kingdoms. Zhao Zhilong starts as a neophyte warrior, but progresses up the ranks rather quickly in the first half - which is by far the most exciting and interesting portion of the film. Zhilong also rescues Liu Bei's son during the first half of the film in an exciting set piece marred only by the manipulated action, which achieves excitement through editing rather than choreography. The action is further manipulated by a combination of undercranking and step printing, creating smudgy action orgies rather than straight-on wartime action. The result of all this post-production massaging is action that sometimes resembles Sammo Hung's contemplative action sequences from the Wong Kar-Wai film Ashes of Time (or Daniel Lee's earlier work What Price Survival?) - which would be great if Three Kingdoms were a contemplative movie. However, it seems to be more of a commercial action drama than a meditation on war and casualties, though the film does dabble in that arena during its second half. That's great because the smudged action returns full force - but even then the film requires a greater sense of continuity and drama than flying blood, falling horses, and flailing smudged limbs. Multiple characters meet their fates in these battles, and Daniel Lee does only an average job of combining action and emotion. The action in Three Kingdoms is exceptionally montage-heavy, reducing its ability to excite in a visceral fashion. Also problematic is the film's cursory nature, plus its third-party narrator. The film covers over thirty years, as we witness Zhilong grow from a young soldier to an old general, and the audience witnesses his achievements mostly through the voiceover from Sammo Hung's Pingan. This puts some distance between the audience and Zhilong, and it's hard for Hung to carry the film as his character is neither heroic nor true to the Three Kingdoms Era lore. The film can still get by, as Zhilong's importance and legend can easily be assumed. Zhao Zhilong is well known as one of Shu's supreme badasses, and Andy Lau is one of the few Hong Kong superstars who can tackle such an honorable, righteous role without being miscast. Lau is solid and iconic as Zhilong, but the film makes him too distant to flesh out his character's larger-than-life personality. Ultimately, the film may stray too far from the meat and potatoes of its Three Kingdoms source material. Having a made-up narrator is one problem, as Pingan has little identification for the audience besides the fact that he's being played by Sammo Hung. The reason that many audiences may want to see this film is because it features legendary heroes whose fame goes far beyond a two-hour Andy Lau film. The actors that embody the really iconic roles (i.e., Andy Lau, Ti Lung ,Chen Zhihui, and Yueh Hua) are thrilling to see onscreen, but besides Lau, those actors are gone midway through the film, and are instead replaced by lesser known, if not invented figures played by Vanness Wu, Andy On, and finally Maggie Q, in a dour and rather remote performance. The shift does affect the film; after the entertaining and rousing first half, the proceedings begin to sag noticeably.